Home > Adventure Found Here! We’re so thrilled to have a new, shining jewel in our area for outdoor recreation of all types. The Alder Creek Adventure Center, located in Tahoe Donner development, here in Truckee, opened it’s doors this past Thanksgiving. Just recently voted No. 3 in North America by USA Today’s 10Best Readers, this new facility boasts streamlined rental services, larger wax rooms and locker rooms, expanded indoor and outdoor seating, a large Nordic retail store, a pub with televisions and a fireplace. Additional improvements include new rental equipment and a retail shop with one of the largest selections of Nordic attire and accessories available in the Truckee and Lake Tahoe region. Whether you are a Nordic skier or not, you’ll love the jackets, sweaters, pants, gloves, hats and more available from leading brands including Salomon, Swix, Fischer, Kuhl, Sherpa, Pistil, Wigwam and Smartwool. Years in the planning and construction, the new center is a dream come true for its dedicated team of visionaries, and the public that gets to enjoy it. In the early 70s, when the first structure was built, it was designed solely as an equestrian barn. It was later modified to handle a wintertime cross country operation and subsequently expanded multiple times to sufficiently accommodate the growing popularity of Nordic activities. But soon, the demand far outpaced the capacity of the building and changes needed to be made. Beginning in January of 2010, Tahoe Donner management and the General Plan Committee began holding town hall meetings in order to solicit feedback about future capital development in the association. 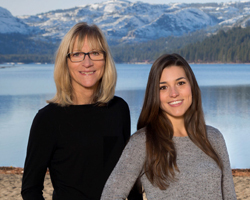 A percentage of every Tahoe Donner homeowner’s annual assessment is earmarked for capital projects, and this fund had grown to a sufficient amount, allowing for the realization of this project. During the formal planning phases, Tahoe Donner began to work with local consultants, planners, and researchers to bring the project to fruition. The project included smart design concepts based on staff feedback and integrated usage for school teams, young children, and educational purposes. The group took all these various ideas, wants and needs and synthesized them into a design concept. The energy-efficient building was also designed to be environmentally conscious. Architects took pains to design the parking lots to avoid runoff into the environmentally fragile wetlands surrounding the center. After a final design concept was approved by the Town of Truckee building and planning departments and construction could begin. The Nordic Center was open during last winter’s rather dismal season, operating out of portable trailers. The certificate of occupancy was granted last summer and the grand opening of the center took place on Thanksgiving Day 2015, with a lovely blanket of early season snow. But winter sports enthusiasts are not the only ones who will benefit from the building. The Alder Creek Adventure Center was designed to accommodate large parties, weddings, corporate meetings, banquets and more year round. There is even a top-of-the-line movie screen projector with 500 watt speakers, extending 200 feet in length with 1080 pixels at 7000 lumens with Blu-ray, PC and Apple TV connectivity, which is the perfect addition to any event where visual aids or movies are desired. In the summer, the building will house Tahoe Donner’s Equestrian Center and Bikeworks operations, while allowing access to the extensive trail system of Tahoe Donner and the remote beauty of Euer Valley. Tahoe Donner operates a wide variety of recreational facilities – some which are for members only and others which are also open to the general public. It is one of America’s largest homeowner’s associations, with nearly 6,500 properties and 25,000 members enjoying over 7,000 acres in the Sierra Nevada. Tahoe Donner Cross Country Ski Area offers over 100 kilometers of terrain, specially prepared for the best experience for traditional cross country striding, skate skiing, snowshoeing and fat biking. The Alder Creek Adventure Center and Tahoe Donner Cross Country Ski Area are located at 15275 Alder Creek Road, Truckee. Call 530-587-9484 or visit www.tahoedonner.com/cross-country for more information.